In the far north of Portugal, the Minho district is famed for its Vinho Verdes, "green wines" produced from grapes that are just freshly ripe. These lightly-ripened grapes give bright, fresh wines, often with a hint of carbonation, designed to be drunk very fresh and young. While most Vinho Verde is white, there are red and rose Vinho Verdes produced as well. 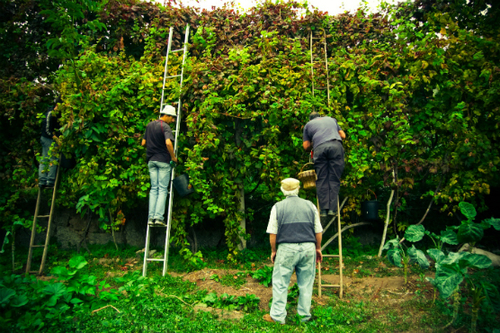 Vines in this district are traditionally trained high and over pergolas, often with vegetable crops grown in the available land under the grape arbors. This efficient use of farmland also helps prevent diseases associated with crop monoculture from gaining a foothold. A beautiful crisp, slightly (but not overly) frizzante, made of a blend of Loureiro and Trajadura. slightly riper (and slightly higher alcohol because of it), this is real wine at the "entry-level" price for Verde. This one is really amazing. 90% Vinhao, and 5% each Padeiro and Espadeiro, brilliant fruit, just the right touch of fizz... figure a bottle per person at the least!